Left tackle Cody Arledge has committed to Yale, scntx.com has reported. Arledge is an offensive lineman at Plano West in Texas. The 6-5, 245-pound tackle was a second team all-district pick and helped lead an offense that compiled over 4,000 rushing yards. He also had offers from Harvard, New Mexico State, Navy and Texas State. Yale captain Beau Palin has been announced as a nominee for the 2013 Allstate AFCA Good Works Team. Palin is serving as assistant director of the Warrior-Scholar Project, he volunteers at Yale-New Haven Children’s Hospital and also works with the Mandi Schwartz Marrow Done Drive Committee. Yale junior RB Tyler Varga was named to the TSN Pre-Season All-America second team and the Beyond Sports Network third team. Varga led the nation with 194 all-purpose yards per game. He also had 935 rushing yards with eight TDs over eight games. As seen in Yale Alumni Magazine, the Bulldogs will be sporting a new look this season. According to the article, "[Head coach Tony] Reno’s design aims to celebrate the Yale teams from the latter half of the twentieth century by maintaining the classic, simple elements that earned Yale a spot in Sports Illustrated’s Top Ten College Football Uniforms. The nods to the past began last year when he replaced the thick, outlined "Y" helmet sticker for the slimmer “Y” of the Calvin Hill era." 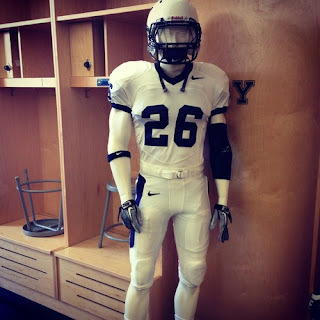 "With the modern-era bulldog logo (known as the "Y-dog") removed from the shoulder, the Bulldogs will look strikingly similar to the teams coached by Carm Cozza and other Yale legends. But with help from equipment manager Jeff Torre, Reno ensured any attempts to harken back to the past did not affect the jersey quality." Emanuel Beal, Hillgrove: Caught 43 passes for 855 yards and seven TDs last season. Has offers from Georgia Tech, N.C. State, Vanderbilt, along with the Bulldogs. Nate Brown, North Gwinnett: Had 41 receptions for 491 yards and nine TDs. Also has offers from Illinois, Louisville, Minnesota, Vanderbilt. Daniel Clements, Alpharetta: Posted 60 catches for 1,286 yards and 12 TDs last season. Offers from Air Force and Yale. A pair of Yale juniors, P Kyle Cazzetta and RB Tyler Varga, have been selected to the College Football Performance Awards Watch List. Cazzetta averaged 40 yards per punt last season and had 13 punts inside the 20-yard line. Cazzetta will compete for the Bulldogs starting kicker job, too. Meanwhile, Varga rushed for 935 yards and eight touchdowns last season. He led the Ivy League in rushing yards per game, earning first-team All-Ivy honors. Varga was also last season’s CFPA Elite All-Purpose Award winner after leading the FCS in all-purpose yards per game. The complete list of players can be found here.